Helmut Lang's perfumes (originally issued in the early 2000s) are often described as "cult" fragrances. I never tried the perfumes when they made their debuts so my reviews will tackle today's re-release formulas. Cuiron is a sheer leather fragrance, a combination of muskiness and salty/aquatic leather — imitation ambergris? Though Cuiron feels light, it has good tenacity and casts a wide net upon initial application. What Cuiron delivers at first spritz is basically what you get till the fade-out: 'watery' leather, musk, light amber. At the end of its development there's a hint of amber powder mixing with a skunk-y musk. To say this is one of my least-liked leather perfumes is an understatement; I felt uncomfortable wearing it and wanted to wash it off (but didn't...I wore it two days in a row for this review). When I read Helmut Lang Eau de Cologne's list of notes I braced myself for a BIG "Whoa! "...unfortunately all I uttered when I sprayed it on was a wan "Whaaaa?" Ignore the energetic-sounding (supposed) notes and prepare yourself for an exhausted lie-down, not a wild ride. Eau de Cologne starts with an aroma I'll describe as "candy meets medicine" (it brought to mind a natural remedy...maybe for a sore throat). Eau de Cologne is sheer as can be and disappears on skin before an hour is up. I detect 'wasted' petitgrain, anemic artemisia and some bushed rosemary — a single rosemary leaf you pinch in the garden or kitchen packs more of a punch than a good dose of Eau de Cologne. As for the skin accord, I think I smell it in the base notes — this is the smell of skin bathed in pre-surgery antiseptic. At $185, Eau de Cologne is a steal...but NOT in a good way! I'm happy to write that Eau de Parfum, same notes as Eau de Cologne, has recovered from its "cologne" malady and been restored to health; it's had a heart (note) transplant. Upon application, I smell buoyant orange leaf, rich artemisia and jasmine. Eau de Parfum has a barbershop vibe, but a neat barbershop vibe (think of a retro barbershop in Cuba). As Eau de Parfum develops, a cheery heliotrope note appears and is joined by a wood-y accord; the extreme dry-down presents sweet citrus-infused talc. Eau de Parfum has four times the staying power of Eau de Cologne (it lasts about 4 hours when liberally applied); sillage is close to the body. VERDICT (as Robin here at NST(TM) often says): I only like one of the three Helmut Lang re-issues, and even the one I like does not tempt me to purchase. If anyone out there wore the original Helmut Lang scents when they were first released and has tried the new versions, please comment. 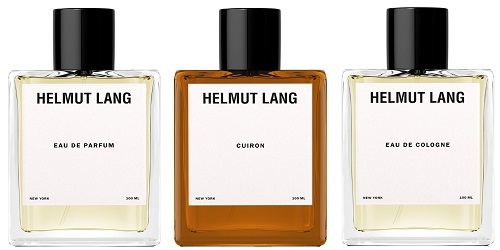 Helmut Lang Cuiron Eau de Parfum ($165), Helmut Lang Eau de Cologne ($185) and Helmut Lang Eau de Parfum ($185) are available in 100 ml. I sampled the cologne and edp back in the day. I remember the edc smelling of baby powder and pool water. I don’t remember the edp at all, which may be worse than smelling of baby powder and pool water. Monkeytoe, yes, there is a chemical smell still there. Frankly, I’m surprised these perfumes have generated such a cult following. OK, so I haven’t smelled Cuiron, but I agree completely with monkeytoe’s description of the edc (the edp wasn’t that much better to my nose, either), and both concentrations I’ve tried were vintage. Dusan, I would love to see the cult members! It must be a real drag to spend to much time and effort testing, thinking and writing about so many disappointing fragrances. I hope your next batch will be more inspiring and fulfilling! It if makes you feel any better, I still get enormous satisfaction wearing the “new” Carven Vetiver that I bought blind based on your review last year. Your nose definitely helps my radar. AnnS: so happy to hear that! I’m going to look up the Carven vetiver review now! Mayfly…I see someone has the buying bug! I’m glad you reviewed these (although sorry you lost several days of perfume life to do so). You’d be a rich man if we paid you even one-tenth of the money you save us, Kevin! I have a bottle of the original edp and I think it’s wonderful. A dense woody vanilla with some skanky musk in the base. The scent that I think is closest to the original edp (but not as good) is Frederic Malles scent for Dries van Noten. AS, wow…would never associate the new EdP with the Malle! Funny, I wore my Vintage bottle of Helmut Lang Men’s (which was what the Original EdC was marketed as) and It reconfirmed why it is one of my favorites. I smelled nothing of the disappointment that the reviewer did and had no need to strain to smell it. It’s been, here, almost 12 hours since I spritzed and I can still smell it. You have to get in close, (but, well, isn’t that the best way for someone to smell your fragrance? ) But it’s there. So, Whatever isn’t working on the reviewer’s skin is surely working here. I have adored this scent for ages now, honestly haven’t smelled the re-releases, but if they are true to the older ones, I am glad that I, Luckily, Am in the supposed “Cult” For, I most certainly am. Consider now, that you have met a Member! Glad to be a cult member too, apparently. May the cult live on and enjoy, then! So glad it works for you! I wish I could smell what you’re smelling but I must be anosmic to some of the accords. When they were first launched I really liked the EdP, should have bought the cologne and was very disappointed with Cuiron. I’m glad you reviewed them and very glad they are back. Just wanted to add that even if it’s hard to tell, your writing on them seems to differ quite a bit. I don’t think the EdP and Cologne had the same list of notes. Iirc the Cologne were launched as a men’s version. I remember it as a casual but sensual thing and a bit of a ‘skin scent’.Going to look for the relaunched ones. des esseintes, I went by the HL lists of notes, but I always take these lists’ veracity with, shall we say, “caution.” Hope these relaunches are satisfying for you.